Seems that just about everyone has an opinion, and lots of folks want others to know their cleverness. Problem is, many of them give equal cogitation to deeper matters as well as their favorite seasoning in a casserole. Not helpful. In fact, such uninformed (and often prejudicial) conjectures are actually harmful because of the negative reactions they provoke in others, and reinforce negativity in those expressing the opinions. 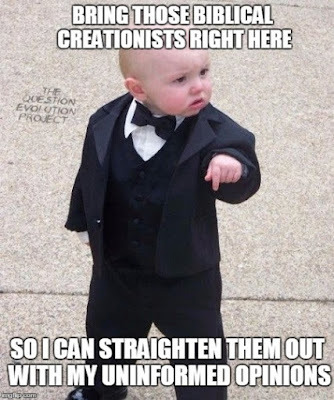 Secularists are famous for demonizing Christians, and especially biblical creationists, for denying materialism and common-ancestor evolution. Quite often when they catapult their atheopathic sentiments at The Question Evolution Project, we feel there's no reason to give them a platform for odious rhetoric based on bad logic and little (usually no) research. Here's an example of a hateful reaction that is eradicated by a knowledgeable creationist. Although the article is from 2004, the material is still quite valid today. To see Dr. Sarfati's devastating response, click on "Anti-creationist slanders are back-to-front: the evolutionary basis for racism, eugenics and Nazism". Dinosaurs Done in by Dark Matter? Take a LUCA That Ancestor! What Do Monkeys Have to Say?